LOS ANGELES — Hawaii’s Kilauea volcano erupted from its summit early Thursday, shooting a huge plume of ash miles into the sky and prompting authorities to urge area residents to take cover. The Hawaii Volcano Observatory said the explosion within Kilauea’s Halemaumau crater -- the biggest since the volcano became more active on May 3 -- had produced a volcanic cloud that reached as high as 30,000 feet (9,000 meters) and was drifting downwind to the northeast. "Not your average wake-up call at the Kilauea Volcano summit," the US Geological Survey said of the 4:17 am (local time) blast that lasted a few minutes. The Observatory said residents living along the path of the ash plume should take shelter, and maintained a code red aviation alert signaled on Tuesday, meaning no air traffic was permitted in the area. "At any time, activity may again become more explosive, increasing the intensity of ash production and producing ballistic projectiles near the vent," it said in a statement. 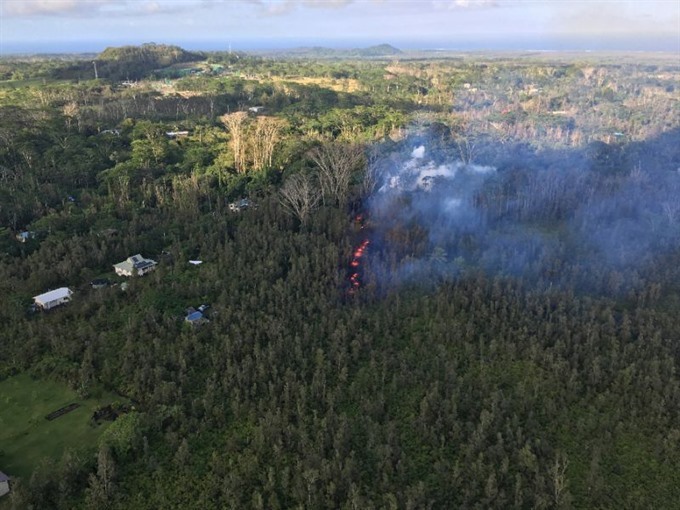 Authorities by afternoon said weak winds and rain meant that ash fallout from the latest eruption was largely contained in areas around the Kilauea summit. "We’ve had reports of light ash fall in Hawaii’s Volcanoes National Park and we expect that folks may be experiencing trace ash fall around Volcano Village," Michelle Coombs, a volcanologist at the US Geological Survey, told reporters at a daily briefing. "We expect activity could wax and wane like this in the near future," she added. Kilauea is one of the most active volcanoes in the world and one of five on Hawaii’s Big Island. It started erupting on May 3, prompting about 2,000 people to flee from their mountainside homes. The latest steam-driven burst on Thursday came two days after Halemaumau crater sent "ballistic blocks" of rock and another massive plume of volcanic ash shooting into the sky. Kevin Kushel, a resident of the island, told AFP that Thursday’s plume of smoke could be seen miles away.